Johann Liss (also called Jan Lys) (c. 1597 or 1590 – 1631 or 1627) was a leading German Baroque painter of the 17th century, active mainly in Venice. Liss was born in Oldenburg (Holstein) in Schleswig-Holstein, Germany. 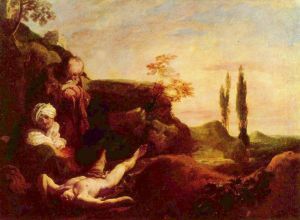 After an initial education in his home state, he continued his studies, perhaps with Hendrick Goltzius in the Netherlands, visiting Amsterdam, Haarlem, and Antwerp, where he could have encountered the Flemish Jacob Jordaens. Around 1620 he travelled through Paris to Venice. 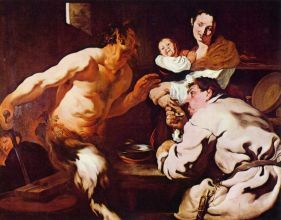 He moved to Rome around 1620-2, and his first works there were influenced by the style of Caravaggio. 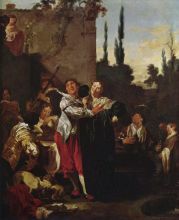 Although his earlier work was concerned with the contrasts of light and shade, his final move to Venice in the early 1620s modified his style and gave impetus to brilliant color and a spirited treatment of the painted surface.In 1627, he was created an admired large altarpiece, the Inspiration of Saint Jerome in San Nicolò da Tolentino. 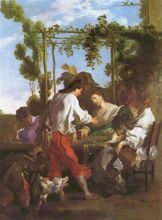 His loose brushstrokes seem precursor to rococo styles of Guardi brothers.This final style, along with that of other "foreign" painters residing in Venice, Domenico Fetti and Bernardo Strozzi, represent the first inroads of Baroque style into the republic. 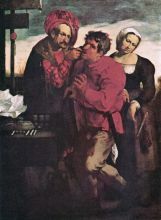 Liss fled to Verona to escape the Plague spreading in Venice, but succumbed there prematurely in 1629. 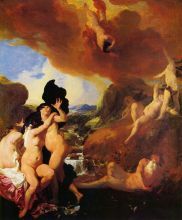 His legacy is as a painter of both sensuous mythological and pious biblical subjects, a master of colors and Baroque painting. 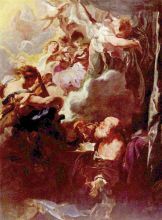 He was most influential to Venetian 18th century painters like Sebastiano Ricci, Giovanni Battista Tiepolo and Giovanni Piazzetta.